I’ve been running my life on a 2013 Macbook Air for a while now. Blog posts, research, work, gaming, etc…. and its been alright, but there’s only so much you can do on a laptop when it comes to more demanding things like video editing and gaming. Even just opening 10 tabs on Chrome while doing research for a blog project tends to slow everything down, so I started the process of building my own monster desktop, and this post is now the result of that endeavor. It is true that it’s much faster and easier to just go buy a ready made desktop at your local store, or order one online, but I had very specific ideals for what I wanted and I wanted to build it for less money, which you can do if you find the right deals on parts. But don’t let the idea of building a computer scare you off. It’s not as complicated as it looks. So below I’m going to link to PCPartPicker, a great site that helps you see what’s new, current, and compatible and helps you find the best prices, and go through why I chose the parts that I did after a lot of research. Also, I used www.logicalincrements.com to help me set a price range and set expectations for myself on what kind of performance I can expect. Which is pretty high performance. Let’s break this down and I’ll explain why I chose my parts the way I did. First of all, my budget was $1000, but the total listed above is much higher. Thats because it includes some things I already have but listed here anyway in case you don’t have similar parts lying around. I had a monitor, mouse, keyboard, and two HDD drives already, plus I ordered most of my parts on Cyber Monday and got huge discounts, so my cost was around $900. If you are patient and shop around, you too can get great deals! CPU: The i5-6500 cpu is arguably the most powerful mid-range CPU on the market (at the time of this writing). If you’re not planning on overclocking (95% of you) then get this CPU. Motherboard: There are tons of different options for a motherboard, but my chief factors for getting this one are mid-range price, large amount of supported RAM, extra PCI-E slots, good reviews, and speed. RAM: 8GB of RAM may be all you need, but I opted for 16GB for a few reasons. #1 I found it cheap. #2 I do some video and picture editing, as well as some music production, and I love having lots of programs open at once. To me it was worth the extra $40. Also, the RAM I chose is 3000mhz RAM, which is a bit faster than average. You may not be able to tell during everyday use, but I didnt want this to be a bottleneck when it comes to full power usage. Storage: You need a SSD for your main hard drive. No matter what you want to build for the rest of your computer parts, you need your main windows install drive to be an SSD. It dramatically increases startup speed and program load speed. I picked a 512GB SSD here, but you can go as small as 64GB if you just want windows and some small programs. As you can see, I put in 2 HDD’s (1 x 1TB and 1 x 2TB) drives as large scale, less frequently used storage. One drive is dedicated to download and Steam games, and the other is dedicated to be an Adobe Premier and Photoshop storage drive where it will keep rendered files while I’m working on things. Having these on a drive different than the program is running on allows everything to be faster. GPU: (video card) The onboard graphics of the i5 chip aren’t that bad to begin with, so if you only play casual games or are fine with low detail on less demanding games, or don’t game at all, you can skip this. The GTX1060 is a very powerful graphics card and is new on the street. It dwarfs cards that were top of the line just a year or two ago and can support VR headsets. This card excels at 1080p gaming (and some games it supports at 1440p) at ultra/max settings, but don’t expect to push 4k. For that you need the GTX1070 or GTX1080, which are both a lot more expensive. I can tell you now that I’ve gotten it hooked up that everything I play now is dang beautiful. Case: There are thousands of computer cases, but I chose this one because its simple, looks nice, and allows me to very cleanly run the cables around the case without interfering with airflow. Power Supply: 80+ gold means that its more efficient with power, generating less heat and wasting less money over time, so thats nice. 650 W might be a bit overkill for this comp, since PCPartPicker estimates a 339W max power draw, but I wanted to have some overhead room to add more stuff later. Also, you don’t want to have juuuuust enough power, and it’s not that expensive to get a bit more. Optical Drive: The optical drive is definitely fading out of use, since I can download almost any program I need online and run it from my computer, but I’ve got a ton of old picture disks and game disks that I’d like to go back through and they are cheap. A CD/DVD drive runs about $20 and add blue ray to that and go up to about $45. The one I chose can also record DVD and BlueRay so I can store lots of data as backups on physical media and keep them somewhere. Wireless Network Adapter: The motherboard has an ethernet plugin, but my computer is going to be far from a place it can plug in, so I added a cheap wifi card to get online more easily. This card is simple are required no actual configuration. Just plug it in and it works. Case Fan: The case comes with some already, but I wanted max airflow so I ordered a couple extra. Heat is the enemy of computers, so don’t skimp here. CPU Fan: This attaches to the top of the CPU and cools it specifically. The i5-6500 comes with a stock fan, but its small and I wanted something a bit more. These are also fairly inexpensive and I consider it an investment in making my computer run smoothly for years and years. Accessories: Monitor: Keyboard: Mouse: Speakers: These are all things I already had, so I didn’t have to spend extra money, but get what you need. UPS: To keep your computer from any damage, you need to at least have it plugged into a power strip, but to keep it from shutting down immediately during a power outage, you need a UPS. It may only buy you 10-15 minutes, but power flickering has caused me to lose a lot of work in the past because the computer immediately shuts off. Get a cheap one, anything will do. So that’s all the parts! I know that’s a lot, but I promise you can do this if you want to give it a shot. 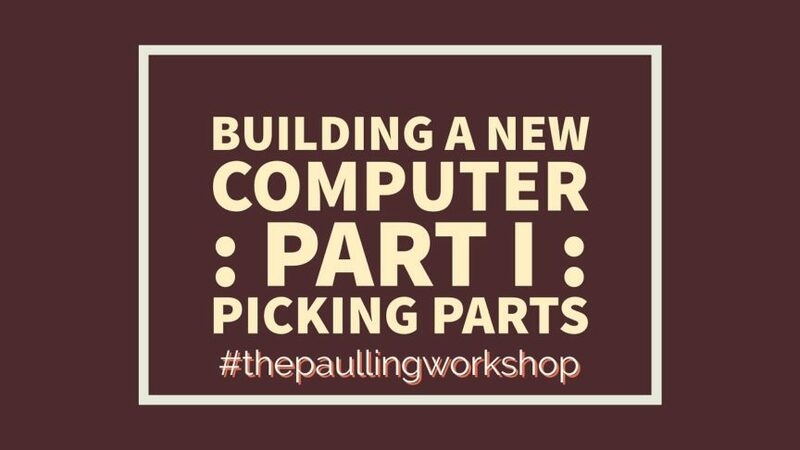 There are thousands of tutorials for how to build computers, and the upcoming part II of this series will be yet another guide you can use to put all this together and get it running. There are few things I’ve done where I feel as accomplished as I do when I hear the boot up chime for a new computer for the first time.